The impressive thing about Main Event this week was that it featured two matches that on paper could have held the main event spot, with one cut short by interference, the other was a solid contest that showed off what the men involved can do well. For me this match felt like WWE taking a look at what Cody Rhodes can still do when tasked with a longer contest, such as this one. It’s been a while since Cody was in a position to have a match anywhere near this length on either TV or PPV, after kind of getting lost in the mix on Raw and Smackdown after the original break down of Team Rhodes Scholars in February. He hasn’t really been given anything to get his teeth into in terms of a feud, apart from a bit part in the Sheamus vs. Damien Sandow feud. It truly is telling that with Money in the Bank coming round, Cody isn’t being talked about as a potential winner, as he’s been the first name on most people’s lips for the last few years events. The match was a back and forth type of contest, with each man being given just enough time in control of the match to showcase what they are capable of in the ring. The majority of the contest focussed around an injury to Jericho’s eye, caused after a stray thumb from Cody Rhodes. It was nice twist on the heel taking advantage of an injury type of match, which would usually see the heel work on the arm or leg. Rhodes used a lot of his signature moves throughout the contest including a beautiful moonsault onto a standing Jericho, the Disaster Kick (taking advantage of the Jericho’s eye) a huge Alabama Slam and Cross Rhodes all of which got him a two count. Rhodes managed to keep himself looking strong enough with by getting his foot on the ropes after a Codebreaker. The end of the match saw Jericho block a kick from Rhodes, and after a long struggle eventually manage to turn it into the Walls of Jericho, resulting in the submission victory. I enjoyed this ending, as with Cody reaching and clawing to get to Jericho’s eye before he was turned over it felt like the storyline running throughout the match had led somewhere and brought a satisfactory conclusion to what was a good contest, for both men. Chris Jericho has been known over the last few years for helping young talent get over with the WWE audience, mainly due to his selfless style of wrestling which allows his opponents to look as good as possible, as well as years of wrestling knowledge built up from around the world. Cody Rhodes certainly benefitted from being in the ring with Jericho for this amount of time and the psychology and story throughout the contest was spot on. It would seem Rhodes is being positioned for another repackage soon, after a long losing streak and having seen his finishing moves kicked out of by a number of opponent on the way. WWE would be foolish to let a talent like Rhodes go without ever giving him a proper chance to run with the ball. I mentioned at the start of this review that there was another match that could have potentially taken the Main Event spot, and if the rivalry hadn’t been completely missed from Raw this week it probably would have been. 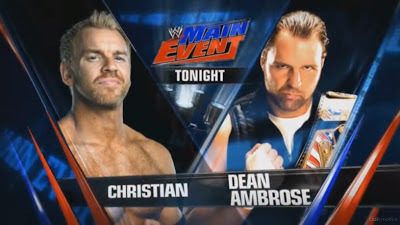 The match in question was Christian against the United States Champion Dean Ambrose of The Shield, it certainly had potential to fill the fifteen to twenty minute slot and with the rivalry behind it could arguably been a bigger draw than Jericho-Rhodes. The match was essentially a brawl between the two spilling to the outside before Ambrose took control with a nice version of an STF. With Christian hitting a number of familiar moves, this match finally looked to be getting going, but was the unfortunately cut short as Tag Team Champions Seth Rollins and Roman Reigns interfered to push Christian off the top, to give Christian the disqualification win. It was a shame to have this match end so quickly, especially with a number of Ambrose’s matches having had similar endings recently, he hasn’t had much time to show what he can do on his own as of late. With The Shield beating down Christian, the number one contenders The Usos made the save, seeing off The Shield in style. Whilst both Christian and The Usos deserve to be in this position with The Shield, it’s difficult to see either in the same position as some of The Shield’s opponents over recent months. Before Tons of Funk made their entrance to face The Prime Time Players, they were given a new entrance with The Funkadactyls and new Diva Jo-Jo (who’ll be appearing on reality show Total Divas in July) sang the entrance theme. It really was awful to watch and I felt pretty uncomfortable watching the three young ladies struggle in the ring, luckily this wasn’t Raw and hopefully it never happens again. Luckily the match was good tag team fare, with both teams looking good in the ring. It’s a shame we don’t see enough of Clay and Tensai as a duo, because as big men go they’re pretty good in the ring. The Prime Time Players needed the win to go into their match on Raw with CM Punk and Curtis Axel looking strong and duly delivered when Darren Young hit Brodus with his afro comb, allowing Titus O’Neil to get the pinfall, in a nice ending to develop the heel duo. For the first time this week, I was disappointed with a Zeb Colter promo. I was behind the partnership with Antonio Cesaro to start with, if it emphasised how Colter had back tracked from his previous position, however that does not look to be the case. What was presented here was a over long rambling promo that took way too many tangents and seemed to forget that Colter was now aligned with a foreigner. Cesaro attempted to pull it back with a decent promo of his own, but it couldn’t quite paper over the cracks in the logic of their relationship. I'm sure the crowd chanting U-S-A was not the desired reaction!